Yesterday I joined the protest organised by Aid to the Church in Need in support of the Christians in Iraq and Syria who are being butchered by ISIS for being nothing more than Christians. It was across the road from the Houses of Parliament. When I arrived there was was good crowd assembling. The crowd was easy to to spot as so many of them wore the same white teeshirts. Already banners were unfurling and clergymen in various types of attire from the middle east were also gathering. Having bumped into a friend I was expecting to meet there, who is a priest, he pointed me where he was standing as he handed out rosary cards and I went and joined his friends. I soon got into conversation with a gentleman called Jack, a convert to Catholicism who had made the journey that day from Bristol to join us. Jack was a little concerned as he had not seen any of the friends he was expecting to meet, Jack and I chatted, I introduced him to my new friends who Fr Charles had introduced me to five minutes before and we stood together holding our ن signs. About midday the place was suddenly chock-a-block, A group of clergy from various places stood where they could be seen, we prayed together, we chanted together and we stood in solidarity with those who are suffering. 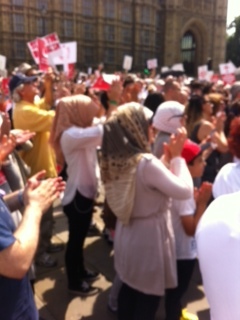 We attempted to march to downing street but were not able to do so. About 1.30pm I left to go home. All day today I have had one image in my head, an image that illustrated the solidarity, an image that showed, this is a human matter, not a religious one, as some passing gent kindly advised us at the top of his voice, it is a human matter, and any decent person will not fail be moved and the proof was in my head, I’m glad I captured it on camera.